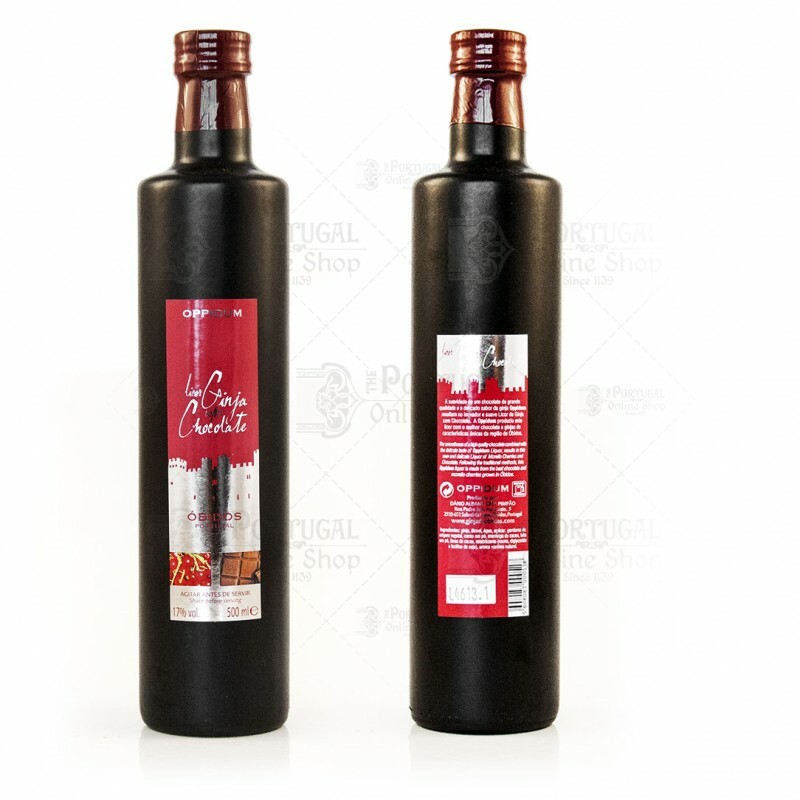 Ginjinha, or simply Ginja, is a famous Portuguese liqueur made from ginja - Morello Cherry berries - sugar and alcohol. Served with or without the ginja fruit in the bottom of the cup, as preferred. This is the latest great creation of the liqueur maker, a creation which, because of its unique properties, is held in high regard amongst consumers, a result of the perfect harmony between two natural products that complement one another to perfection. 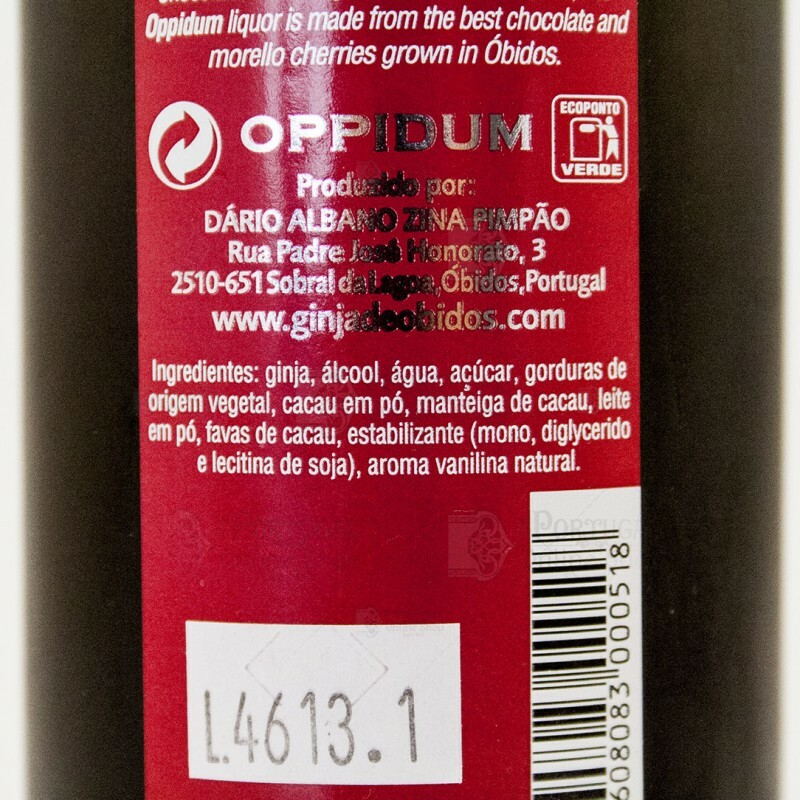 'Ginja with Chocolate' is an Oppidum exclusive and has been registered under patent number 103324 in the Instituto Nacional da Propriedade Industrial since 23 March 2007 in the name of Dário Albano Zina Pimpão. To enjoy this liqueur at its best, shake vigorously, and drink at room temperature. Some of our clients will tell you that 'Ginja with Chocolate' has aphrodisiac properties. Ingredients: Ginja berries, sugar, alcohol and water. The great secret of Oppidum lies in the fact that it uses only the best fruit to obtain a pure liqueur, aromatic and with a balanced alcoholic gradation, that when savoured offers a smooth and full-bodied flavour. It all starts with the selection of the fruit picked from the morello trees (ginjeiras) in orchards (ginjais) of producers who, for decades, have been suppliers of the morello cherry (ginjas). It has been proven that the less cultivated the morello trees, the more astringent is the fruit and the better the final product. Each peduncle is carefully removed and, once in the factory, the fruit goes into a hydro-alcoholic infusion where it remains some months until it reaches the desired stage, in what is a long process that requires a lot of patience and knowledge, evolving with the passage of time. By its very nature, aging is long term and any attempt to accelerate the process can be disastrous to the final result. Oppidum applies its expertise and know-how accumulated during decades and a philosophy from which it does not deviate, to produce the best Ginja de Óbidos. 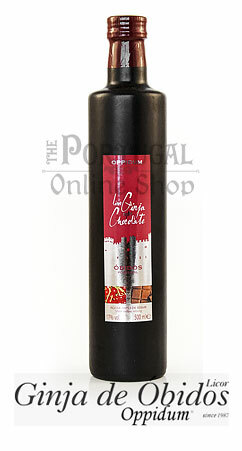 Oppidum is a small, family-run company created officially in 1987 by Dário Pimpão, as a natural sequence to the family tradition of selling ginja (the fruit) to liqueur producers from different parts of the country, namely Alcobaça and Portas de Stº Antão in Lisbon. Located in the village of Sobral da Lagoa, a parish in the municipality of Óbidos and birthplace of the production of the ginja fruit, the experience of living in an environment strongly connected to the land, the abundance in quality of several types of fruits, together with the passion and interest of Dário Pimpão in transforming this raw material into other more sophisticated and refined flavours, led to a natural evolution in the production of sweets, jams and comfits. In an environment whose economy depends in part on the production of the fruit and because of his family's involvement in its commercialisation, it is no surprise that Dário Pimpão's passion and spirit of entrepreneurship led to the idea of producing his own liqueur. His challenge and goal was to produce a liqueur of reference. Mission accomplished! A financially solid company, Oppidum has made several costly investments over time in order to meet the demanding Rules of Hygiene and Safety at Work, required by the governing agency HACCP. We have also implemented the quality management system ISO 9001:2008. A very pleasant enjoyable and different product.